Leon Morrocco studied at Ducan of Jordanstone College of Art, The Slade and Edinburgh College of Art. In 1968 he won an Italian government scholarship to study at the Accademia di Brera in Milan after which he lectured in drawing and painting at Edinburgh College of Art from 1965 to 1968, Glasgow School of Art from 1969 to 1979 and then was appointed Head of Fine Art at the Chrisholm Insitute, Melbourne in 1977, resigning in 1984 to paint full time. 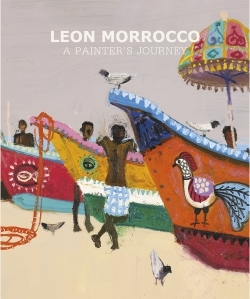 Since his return to the UK in 1991, Morrocco has established an international reputation with successful exhibitions devoted to the Mediterranean, Rome, Havana and India. His paintings are held in notable public and private collections including The Scottish National Gallery of Modern Art, The Scottish Arts Council, Leeds City Art Gallery, The Nuffield Foundation, and Queensland Art Gallery. Liz Lochhead is a poet, playwright and performer and has high national prominence as Scotland's Makar or national poet for the past 6 years. In 2016 she won the Queen's Medal for poetry.